There are exciting new worlds being created, recreated and explored as we speak. There are digital worlds being developed from the inspirations of Earth and beyond. For those of us not able to travel to places like the polar ice caps, the Sistine Chapel, Rome, the Pyramids of Egypt, Mars, or other places we may not be able to visit in our lifetime, this is our chance. Now, we have the opportunity to visit them from the comforts of our very own homes. Our mobile enterprise company, Shockoe.com has recently branched out into the brave new world of Virtual Reality (VR). In this ambitious new venture, there are many things to consider. First, let’s break down the different branches of the digital realities. VR provides the user with a digitally created 360 degree world using a type of headset, whether it’s utilizing Google cardboard, an Oculus or one of the many other options of headset viewers. Augmented Reality (AR) uses our mobile devices and overlays digital images over physical reality (ever heard of Pokemon Go)? Lastly, and my favorite, there’s Mixed Reality (MR). MR might be such an advanced technology, that we likely won’t see this catch on until VR and AR are more of a regularity. MR is the ability to use virtual reality inside of our physical world. For instance, a doctor performing surgery on a patient could use a virtual magnetic resonance imaging (MRI) or X-ray scanner over their patient, providing them with an accurate view inside their patient’s body. Mind-blowing, right? Now that you have an idea of the different realities being created, let me tell you that there is nothing more exciting than having the opportunity to design the User Experience (UX) and User Interface (UI) for these exciting realities. When starting the conversation of UX for VR, it’s easy to get a little carried away. The possibilities seem endless (because they are), which is why it’s important to focus on what’s best for the user, what makes the most sense for the user to do in order to see and navigate our experiences. What does the client want to provide their users? These questions are seemingly simple, yet necessary. A UX/UI designer needs to know what type of VR they are designing for. Is it for a headset alone, headset with camera sensors, or headset with gloves? What are the limitations of this experience? How far can the UX/UI designer push these limitations while still maintaining a fulfilling, yet positive user experience? What can I designer do to keep users returning to their fascinating VR experiences and even share them with others? Users with solo headsets can only use their Field of View (FOV) or Cone of Focus to make their selection, not their hands. While this might seem limiting, it’s not. Keep in mind that this is VR, where the user can turn in any direction they choose and explore a new world by just putting on a headset. Making a selection through vision is quite simple. A UX designer could use a countdown, various loading animations, or status bars. They can even invent something totally new and intuitive that hasn’t been thought of yet. Making a selection is one thing, navigating these new worlds is another. There are a lot of different things to consider when navigating in VR. For one thing, it’s somewhat similar to navigating our physical world in terms of our FOV. We all have our own, some of us more or less than others, and the Cone of Focus is how designers segment the FOV. 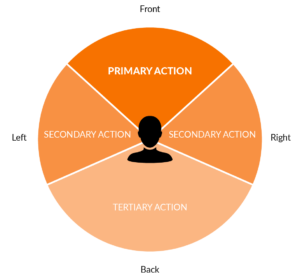 The UX designer should focus the user’s primary actions within the initial area of vision. When we look directly forward, by just moving our eyes we can see approximately 90 degrees within our central vision. Everything outside of that is our far peripheral vision and should be designed accordingly by placing only secondary and tertiary user actions within these areas of vision, such as motion cues or exit options. These are extremely important limitations to know when designing the UX for VR experiences. These degrees of vision define how the UX should be envisioned and implemented. Without making the user work too hard to explore their new digital surroundings, the UX designer must take into account the Cone of Focus for all primary actions without taking away from the extraordinary experience of VR. Thus, making one consider the visual placement of UX design by measurements of FOV degrees throughout the app. While all of this information may seem overwhelming, it is also very, very exciting. Designing UX and UI in 360 degrees is a phenomenal opportunity to learn, adapt and innovate in this amazing new digital age. 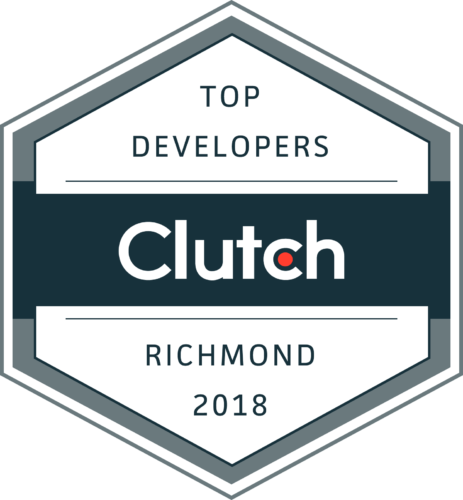 At Shockoe.com, we are on the edge of our seats with excitement about being able to provide our clients with the intuitive experiences their users want through innovative technology that VR offers.